eFRS - Enterprise Mobile Forms App. Mobile Enterprise Forms. Done Right. Stop wading through "almost there" mobile forms products and start with a solution designed for enterprise. Handle complex business rules, secure enterprise mobile forms and mobile form elements based on group permissions, geolocation, signatures, photos. Its all included. Integrates with your Active Directory / LDAP servers. On-site hosting or Cloud plans available. 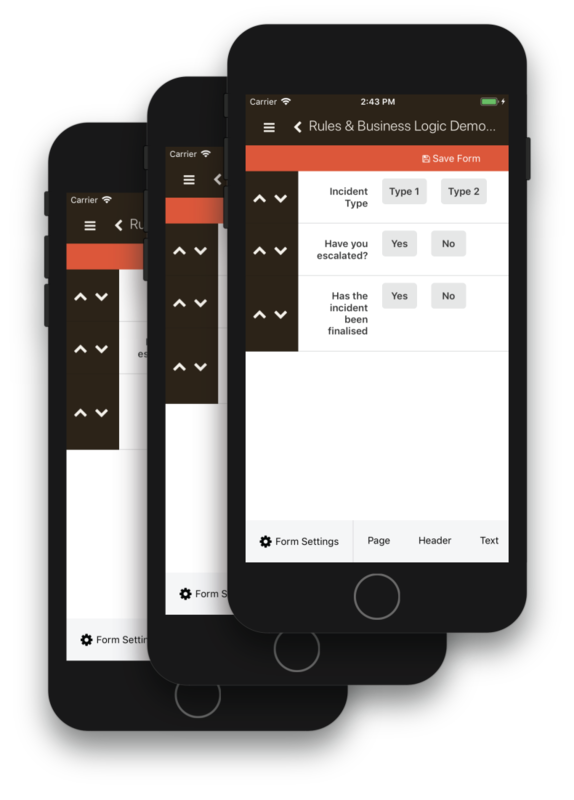 Create almost any mobile form for complex business logic in minutes. eFRS has been designed to support almost any form, and we are constantly amazed at the new uses our customers discover for the system. An eFRS form is a hybrid between a standard paper form, and a custom developed app. You can apply rules and logic to inputs to ensure business requirements are met before data is collected. If you are not sure the system will meet your requirements, please contact us and we will discuss the best approach. We used our expertise delivering apps to some of the largest mining, energy and government organisations in the world to develop the right system for enterprise data collection and data management. We understand the level of quality, flexibility and service you need - and your stakeholders expect. We also have the experience delivering on these expectations. Enables you to create risk / score matrices based on input from other fields on the form. This is particularly useful to give instructions to users about whether to proceed with work. Similar to an excel cell, this field enables the user to perform complex calculations based on other input in the form. 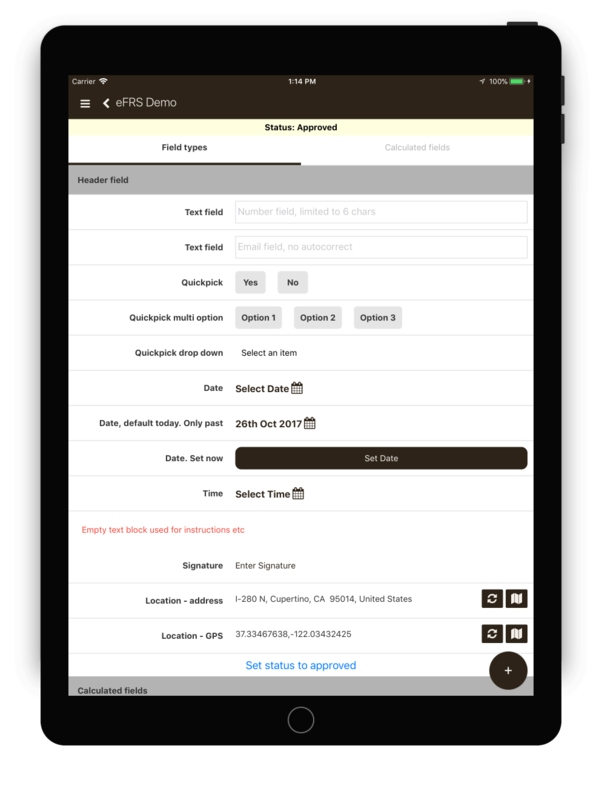 An action field is a single action button that will change the workflow of the form. You can use it to assign the form to others, change the status to “Pending” or “Approved” or use it clear the status of the form. Example applications: Selecting responsible person, or others in attendance. 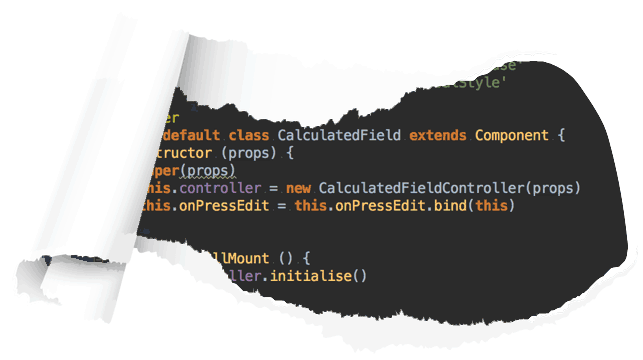 Changing form behaviour based on group / role, such as hiding fields or making them required. In our experience you can define almost any business rule in our system and have it enforced. Users can be assigned tasks to perform within the system. This is done through the completion of a form and assigning it to another user registered within the app. The user is then notified via a push notification and email that the form has been assigned to them. When they open the app they can see forms that have been assigned for their completion on the first screen. This allows complex workflows such as timesheet approval or ensuring supervisors have signed off on work performed. Workflows can be multi stage, for example an employee can assign a form to their supervisor, and that supervisor can assign it to a business department such as payroll for processing. This is the most unique and valuable feature of eFRS. It takes eFRS from a simple form filling solution to a fully fledged enterprise app builder. You can create and enforce complex business rules in your forms. All of this is defined using a simple point and click interface. This could be any log of work performed. In this case the client has logged a number of different users that are rostered on, calculates a number of metrics based on the current shift. This form has over 400 fields, however only the relevant fields to the user are visible at any time. eFRS has the best offline capability on the market right now. Forms and responses can be created offline, results will be uploaded in the background without requiring user interaction. Users can record photos and videos offline and have them uploaded. Offline functionality is very difficult to implement. If you are comparing eFRS to another system and offline use is important, take a close look at both. We have rarely seen offline done well and Google and Microsoft's form systems don’t try at all. eFRS was designed to continue to work in areas with low to zero connectivity. The mobile based form builder is unique to eFRS. Most systems build the form on a web based system, and then you need to transfer that over to a mobile device to see how it looks. Because the form is on the device, you can see how it will look as you build it, so there are no unexpected results. You can also make changes in the field and roll them out immediately. Each page in the form can be restricted to be viewable or editable, or available based on the user’s role. Every time a form is submitted, you can send a copy to a specified list of email addresses. You can also send a copy to the user’s supervisor. The supervisor feature is unique to eFRS. You can add an image banner to the top of every form for branding or information purposes. Directly on your device, without needing to setup any third party integrations, you can create live dashboards for your forms. These dashboards can give you instant feedback on any aspect of your data, from basic information such has how many have been filled in, to breaking down individual responses or adding up the results of fields. You can present the live dashboard in meetings and query it on-the-fly to discuss important aspects in the meeting. Severity of WHS incidents, and changes over time. You can add, invite, set the user role, and set the user’s supervisor right in the app. When a user is invited or a reset password is requested, the user is sent setup instructions instantly to their email. The instructions email has some inbuilt features that will speed along the user onboarding experience, such as detecting the organisation to login to, and skipping any part of the app which is not branded as your organisation. If you would prefer to integrate your user management with Active Directory or integrate with another user management solution, this is possible. Please contact us for a quote. These are only a small list, generally if there is a set list of permissions you need a user to have, these can be supplied. Users are also able to be part of multiple groups and these permissions will combine. Viewing and searching submitted responses in eFRS is first class function. Not only are you able to browse recently submitted responses, but you can search by any input in the form to filter the responses. Using just the actual form, fill in the content that you are want to filter by, click search, and responses matching that information is returned. This simple strategy for filtering and searching means there is no complex querying required, and the user is able to use a familiar interface to search. Results of the search can be viewed immediately on the device, no need to go to a desktop machine to retrieve results. You can export the results of the search directly to an excel compatible CSV file. You can output the data from the form in either a user readable PDF version, or an excel compatible CSV file. The CSV file can be used to run further queries or create advanced reports in excel. An important part of any enterprise system is the ability to track what is happening to the data. eFRS has built in versioning of all forms and responses, so you can see all changes made, roll back to previous versions and be sure that any information gathered is correct. No data in eFRS is deleted. There is no way for a user to remove or clear data from the system at a later date. This ensures that data integrity remains intact and a solid audit trail is maintained. eFRS has been designed from the ground up to satisfy demanding IT departments. You have the option to host with us in the cloud, or deploy our software at your premises or in your private cloud. 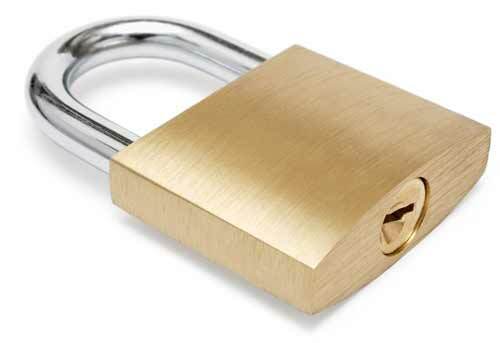 We can integrate any authentication scheme required. In the cloud data is hosted on Amazon AWS and servers are triple redundant, meaning that if connection is lost to one server, another will pick up in its place. Data is also backed up with snapshot backups every 6 hours, and stored for 90 days, in the case of a catastrophic failure, we can restore data and recover quickly and effectively. The app is also designed to run offline without user interaction. If there is sudden connectivity loss with the servers, the app will continue to work until connectivity is restored. If you have specific infrastructure requirements or questions please contact us for more information. 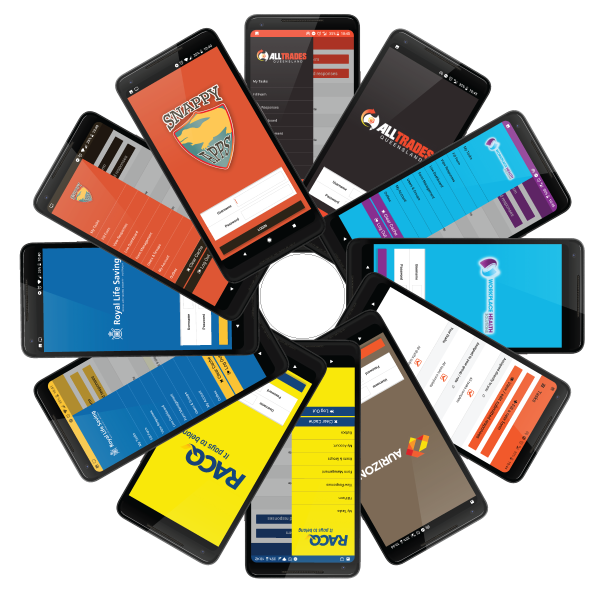 We are app developers at the core, and we have produced a number of other apps for large organisations. So we understand how important it is to have your own company’s branding on the systems you use. eFRS was created as a solution for a number of customers who wanted to create an app, but the cost and time was too high to deliver value for money. As such eFRS is more than just another app from the app app store - it should feel like it your own app, just created on the eFRS platform. This is why the entire app is custom branded and after the first setup screen - which can be skipped in most cases - there are no signs that eFRS is not a bespoke internal app. While the list of features that are ready to use today are extensive, we can deliver custom changes to the system to ensure eFRS completely matches your needs. This is not a take it or leave it offering. If you are requesting a feature that is expected in an upcoming version of eFRS, we may re-prioritise the feature at no additional cost to you. If an item is not on the roadmap we will quote you on creating the feature and you will be given early access to ensure the feature matches your needs exactly. If there is something you would like added to the system let us know. Development costs may be quite reasonable. Pricing is per user, however we customise the pricing to suit your use case - Be it few heavy users or thousands of dormant users, we have a pricing strategy to accommodate your needs. Give us a call on +61755490541 to discuss your needs. Please check your email inbox for your password and install instuctions. Please ensure you have entered all the fields and try again. Give us a call to quickly make sure its the right solution for you. © 2018 Copyright. All Rights Reserved. Created by Snappy Apps.